Anyone familiar with Andrew Gelman's excellent blog, Statistical Modeling, Causal Inference, and Social Science, would be keen to see his new book, aco-authored with Jennifer Hill. 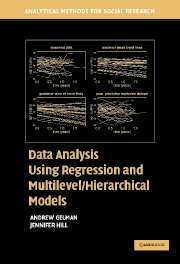 The book is titled Data Analysis Using Regression and Multilevel/Hierarchical Models, and has just been published by Cambridge University Press. Appendixes: A. Six quick tips to improve your regression modeling; B. Statistical graphics for research and presentation; C. Software; References. Caveat: I've ordered it but have not yet seen a copy. Comments welcome from those who have.